“Military expenditure” covers all expenditure on: the armed forces, including peacekeeping forces; defense ministries and other government agencies involved in defense projects; paramilitary forces that are trained, equipped and available for military operations; and military space activities. While the U.S. spends 4% of its GDP on its military, Japan’s spending has only recently surpassed 1% of its GDP. 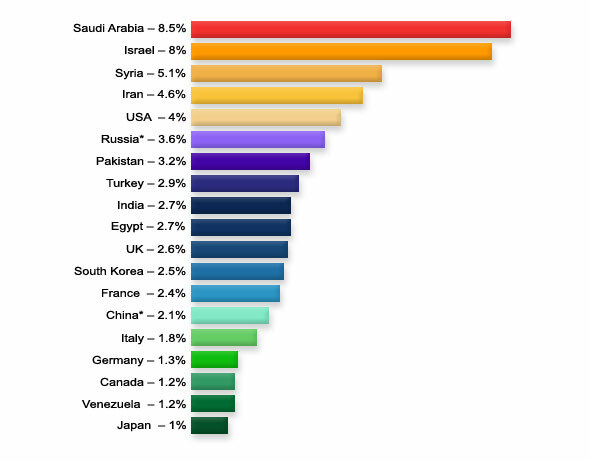 Here is the rest of the world, ranked by military expenditure in millions of USD in 2006. 2006 data for Belize, Central African Republic, Cuba, Czechoslovakia, Djibouti, Equatorial Guinea, Eritrea, Gambia, Guinea, Guinea-Bissau, Guyana, Haiti, Laos, Myanmar (Burma), Niger, Panama, Qatar, Somalia, Sudan, Swaziland, Tajikistan, Togo, Trinidad and Tobago, Turkmenistan, United Arab Emirates, Uzbekistan, Vietnam, and Yugoslavia is unavailable.